Rose Quartz is still having a moment. Gone are the loud, boisterous pinks we used to haphazardly decorate our MySpace or Multiply profiles with (you know, I’m talking about that animated glitter background). This generation’s pink—millennial pink—is having its moment. It’s the more mature version of the Barbie pink our childhood selves are familiar with, except it’s no longer just for girls (as established by post-World War II society). The fact that millennial pink is gender-neutral just adds to its appeal. In 2016, Pantone released two “colors of the year,” and it was the first time they revealed more than one shade: Serenity, an airy light blue, and Rose Quartz, a dusty blush-pink. Both were calming, yet with a sense of whimsy. Home to big design names in the furniture industry like Tom Dixon, Natuzzi, and BoConcept, is three floors worth of instagrammable snapshots. Although they probably rearrange their displays regularly, this is a showroom that doesn’t shy away from color! The previous design for the cosmopolitan Japanese resto was dark and moody, but they’ve since had a makeover. The interiors are now brighter, with light finishes and clean lines. The mint and blush colors—found in the seating and quirky prints on the walls—accent the otherwise neutral space. To complete the rebranding, even their menu has gone millennial pink! If you love pastel, and bright cottage-style interiors along with your all-day breakfast, then it’s time you drop by Stacy’s. This shabby-chic breakfast place has branches in The Fort and in Capitol Hills (the original one). You’ll find the blush hues painted on their walls as well as in their table setting. They even have a SMEG refrigerator in the same color! There’s something about pink and breakfast places. Early Bird’s first branch started in The Fort, but they’ve now expanded to other locations in the metro. Their newer branches feature peachy-pink salmon-colored walls decorated with floral motifs, and of course, birds. Some dishes are also served in pink plates, great for those food shots! Its almost-minimalist interiors, save for the tattoo-esque mural, painted in blush brings the focus on the food. That said, the interior design of the space definitely deserves praise, too, giving diners a complete experience. Early Night in The Fort Strip is one of the newest additions to Manila’s nightclub scene. Its design, especially the façade and al fresco area, could very well be pool party-worthy (minus the pool, of course). If you manage to catch the bar at an empty state (read: pre-happy hour), it’s your chance to indulge yourself. Their entire façade is pretty much painted in a louder shade of millennial pink. Honestly, you won’t need a filter for this one. As if straight out of a Wes Anderson film (see: The Grand Budapest Hotel), the original branch of Sunnies Café is definitely a visual feast. 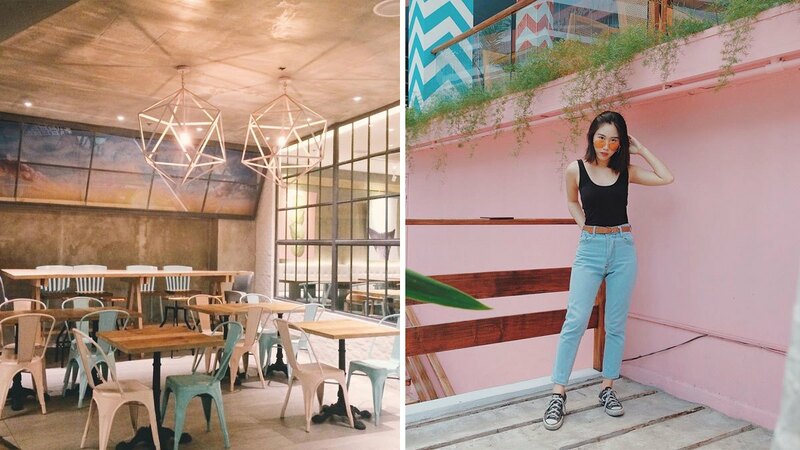 The entire restaurant, catered to the design and brunch-lover, will up your #feedgame but for the ultimate #OOTD, make sure to take a quick a snap or two in front of their blush pink exterior wall or use the salmon-colored door as your backdrop!